Added on May 26, 2014 by Hye-Ryoung Min. 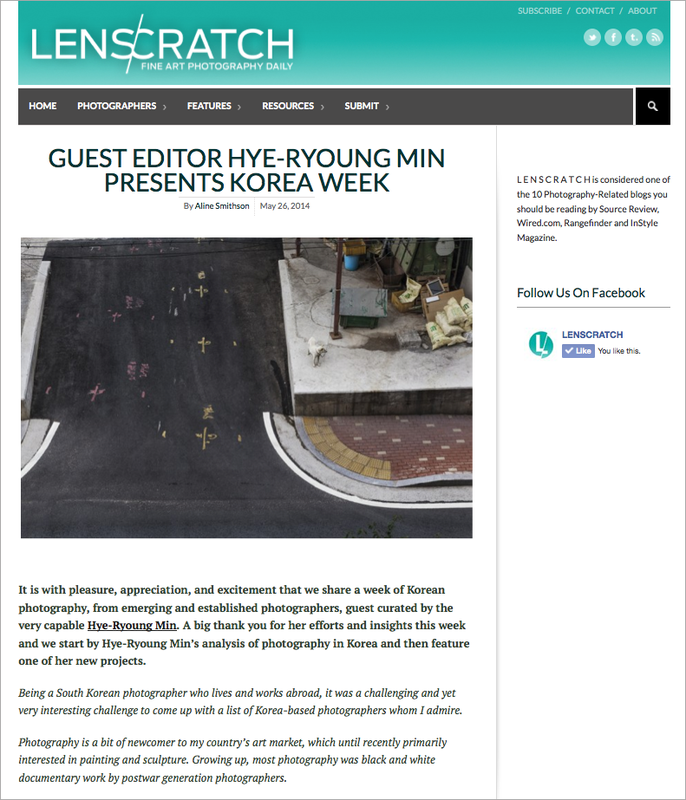 I curated Korea Week on LENSCRATCH as a guest editor which has started today with my new body of work, Personal Landscape. Being a South Korean photographer who lives and works abroad, it was a challenging and yet very interesting challenge to come up with a list of Korea-based photographers whom I admire. Photography is a bit of newcomer to my country’s art market, which until recently primarily interested in painting and sculpture. Growing up, most photography was black and white documentary work by postwar generation photographers. When I left Korea in 2005, there were only few photography galleries in Seoul and those galleries represented a few well-established Korean artists and repeatedly featured their images. Major museums would only invite and curate shows for world famous photographers from the 20century. However, in the last 10 year photography has grown significantly and become more widely appreciated in Korea. Easy access to the internet has allowed a new generation to explore the world of photography and be informed and influenced by various sources. Also, many photographers in this generation study abroad and return with a new vision to our country. Simultaneously, more photography galleries and alternative spaces have opened as have art fairs and photo festivals, providing a much needed infrastructure for growth. I have found that photographers in Korea are still interested in exploring societal and historical concerns which are specific to our country. The transition to digital technology has also affected contemporary photographic practice. Many photographers experiment with the technology itself. I was heartened to discover that artists approach these issues through a very personal lens, sometimes overlapping their own identity with the nation’s. There is often a palpable emotional undercurrent there as well and a sort of unresolved tension and anxiety. And in this regard, I found a similarity to my own artistic practice. Doubtless there is still room to grow for artists, curators and audiences before Korea can be more fully integrated into the international art scene. These days the market should not be limited geographically. I hope Korean photography will continue to thrive and gain visibility. For that reason, I am particularly grateful to Aline Smithson and Lenscratch for inviting me to curate this showcase of contemporary photography from South Korea.